The Mount Vernon Ladies' Association is proud to present this educational series delivered by the 2018 Mount Vernon Distinguished Lecturer of American History Mary Sarah Bilder. This series is designed to provide a deeper understanding of, and expertise in, a particular subject related to George Washington. A reception and book signing will take place after each lecture. Individual event tickets are available for the November 29 program. The final lecture will also be taking place inside the Rubenstein Leadership Hall within the Washington Library. Header Image: Washington as Statesman at the Constitutional Convention, by Junius Brutus Stearns (1856), courtesy of the Virginia Museum of Fine Arts, Richmond, Gift of Edgar William and Bernice Chrysler Garbisch (detail). In May 1787, awaiting the start of the Constitutional Convention, George Washington went to hear a lecture by a lady at the University of Pennsylvania. The lady was Eliza Harriot Barons O’Connor, daughter of a pro-colonist Boston port collector, niece of a British Rear Admiral of the Blue, and wife of a young Irish barrister with American literary ambitions. Award-winning constitutional historian Mary Sarah Bilder will present a provocative set of illustrated lectures arguing that the Constitution was drafted in an extraordinary moment of progress for women. Could women go to school? Could women govern female academies? Could women give lectures? Could women vote? Could women serve as Senators—or even President? The life and career of the remarkable Eliza Harriot O'Connor, first American female lecturer and principal of a female academy, will be our guide as we explore the ways women and men of the framing era understood female intellect and imagined female political capacity. 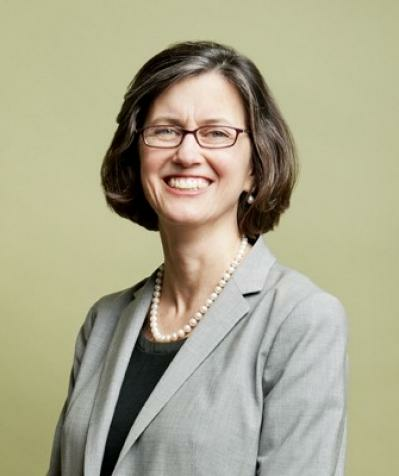 Mary Sarah Bilder is the Founders Professor of Law at Boston College Law School where she teaches in the areas of property, trusts and estates, and American legal and constitutional history. She received her B.A. with Honors and the Dean’s Prize from the University of Wisconsin at Madison, her J.D. from Harvard Law School, and her A.M. and Ph.D. from Harvard University in the History of American Civilization/American Studies. Her recent work has focused on the history of the Constitution, James Madison and the Founders, the history of judicial review, and colonial and founding era constitutionalism. She is the author of Madison’s Hand: Revising the Constitutional Convention (Harvard University Press) which won the Bancroft Prize, considered one of the most prestigious honors in the field of American history, and was a finalist for the 2017 George Washington Prize. In 1786, Eliza Harriot O’Connor opened her French and English boarding school for young ladies in New York, just one example of a transatlantic surge in assertions of “female genius.” Following the public exhibit of the famous painting of the Bluestockings as the Nine Muses, the early 1780s saw female debating societies in London, the political activities of the Duchess of Devonshire, the growing awareness of learned women across Europe, and a rising insistence on women’s education. In 1783, George Washington and other members of the future Constitutional Convention heard a young Princeton graduate, Gilbert Snowden, give an oration urging America’s embrace of female capacity and education. This cosmopolitan, transnational enlightenment vision of female capacity—female genius—contained the foundations for women’s political participation. In May 1787, George Washington heard Eliza Harriot O’Connor lecture at the University of Pennsylvania. She soon also proposed a female-governed Academy with a public female lecturer. One newspaper commentator—possibly her husband—predicted that the drawing room would be “deserted for the forum and the college.” But her plan threatened another emerging approach to female education—one governed and limited by men. To destroy her enterprise, Benjamin Rush wrote the most famous and influential essay on female education, giving public sanction to the belief of “republican motherhood”—that women should be educated so as to be companions to husbands and to raise civic-minded sons. The Constitution was drafted amidst these contrasting visions of female capacity; its final language intriguingly, and perhaps even deliberately, tilted the document towards Eliza Harriot O'Connor’s perspective. In 1788, Eliza Harriot O’Connor visited George Washington at Mount Vernon to obtain advice as she left her new female academy in Alexandria to join her husband in the south. Repeatedly this reality of coverture—the dependent legal status of married women—meant that she offered public lectures and started female schools, only to be compelled to move on because of her husband’s financial problems. The 1790s saw continued steps towards the recognition of the equal capacity and status of women: women voted in New Jersey; female-governed schools began to prosper; the “rights of women” and Mary Wollstonecraft were debated seriously in newspapers. And yet, the economic and legal realities of coverture proved a constant challenge. In 1798, Charles Brockden Brown depicted this debate over the role of women in constitutional politics in “The Rights of Women: Alcuin.” As laws began to explicitly limit the franchise to men, the writing of the Constitution in a time of expanding ideas of female capacity was forgotten. Guests should park in Mount Vernon visitor lots and enter the Library via the pedestrian gate near the four-way traffic intersection. Guests with handicap tags/permits on their vehicle may park at the Library, but must call the Library Projects Assistant in advance. Guests who do not call in advance will not be allowed to park at the Library. Those who wish to eat dinner at the Mount Vernon Inn Restaurant before or after the lectures should contact the Inn directly at opentable.com or (703) 799-5296 for reservations.